Most Federal Aviation Regulations make sense because they are aimed at aviation safety. Some of the safety related rules may seem arbitrary, but they are intended to establish minimum safety standards. Other rules may not be safety related are usually rules that require pilots to show compliance with the regulations. When we use the term ramp check, we are not talking about the unfortunate cases of pilots being approached and questioned by military uniformed personnel from various government agencies. What we are reviewing is the simple case of an FAA operations inspectors walking up in civilian clothes, shaking your hand, and announcing that you’re about to receive a ramp check. The purpose of the ramp check is to verify that the pilot and aircraft are in compliance with the certification regulations. In other words, your paperwork had better be in order. Pilots and aircraft must have certain paperwork to be legal to fly. If you want the actual details of what the FAA inspector is authorized to do on a ramp check, it’s found in FAA Order 8900.1, Chapter 1, Section 4, titled Conduct a FAR Part 91 Ramp Inspection. The pilot must have the following items in his or her possession and must present them upon request by an FAA or law enforcement official. A student pilot must have his or her logbook on cross country flights, and a sport pilot must have either his or her logbook with the appropriate sport pilot endorsements or a record of the endorsements. Recreational pilots must also have proof of endorsement for extended cross-country flying and tower controlled airspace training if they had received those endorsements. Private and higher-rated pilots are not required to carry logbooks with them, and that’s probably a pretty good idea. 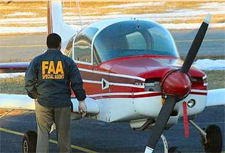 However the FAA inspector may ask you to present some sort of proof of appropriate endorsements, such as a flight review, within a reasonable period of time. The aircraft must also have certain papers to be legal to operate. With a little preparation and a calm demeanor, receiving a ramp check is not that big of a deal. The AOPA has filed comments with the FAA concerning its policy concerning the use of hangars at airports that have received federal funding. The association wants the agency to offer pilots and aircraft owners more flexibility when it comes to the use of hangars at those airports. In formal comments filed Sept. 18, AOPA urges the FAA to expand its definition of “aeronautical use” and to give the owners of private hangars more freedom to use hangars as they wish. AOPA filed its comments in response to the FAA’s proposed updates to policies on the non-aeronautical use of hangars at airports that have received federal Airport Improvement Program funds. While those changes would ease the so-called “sterile hangar” approach, AOPA says the changes do not do enough to meet the needs of aviators.